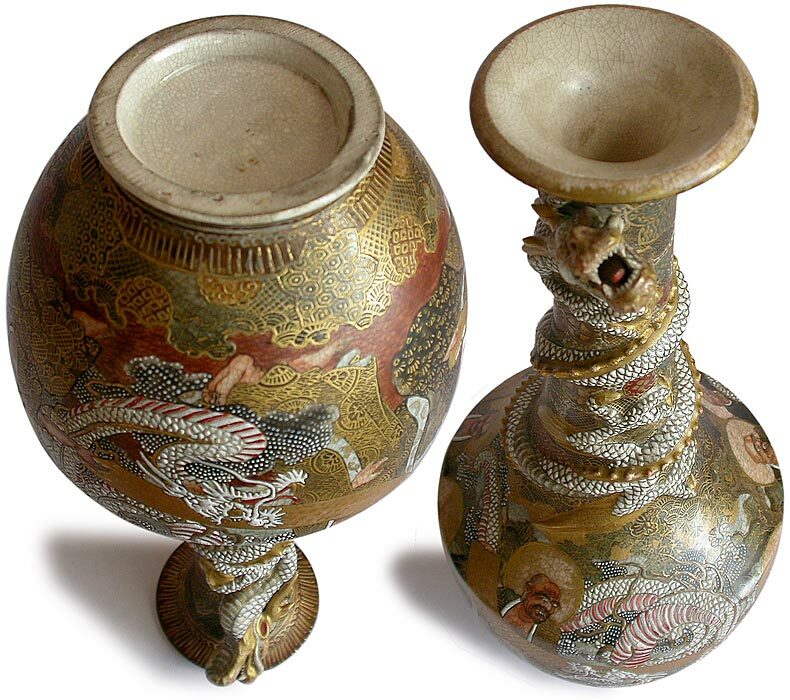 An elaborately glazed and gilded Satusuma vase, depicting eight Rakan (Chinese: Lohan) with three dragons gathering in nirvana, amongst a backdrop of kaleidoscopic golden motifs, pine trees and distant pavilions. Artfully drawn expressive figures covered in gorgeous rich gold on gold overlays, ceam colored crackled with polychrome translucent glaze and gold trim, with a dragon protrude near the opening, and a raised finish on the painted surface gives this piece a tactile and dimensional quality. The opulence found in this early Satsuma vase is a fine example of the cultural flowering during the Meiji era.